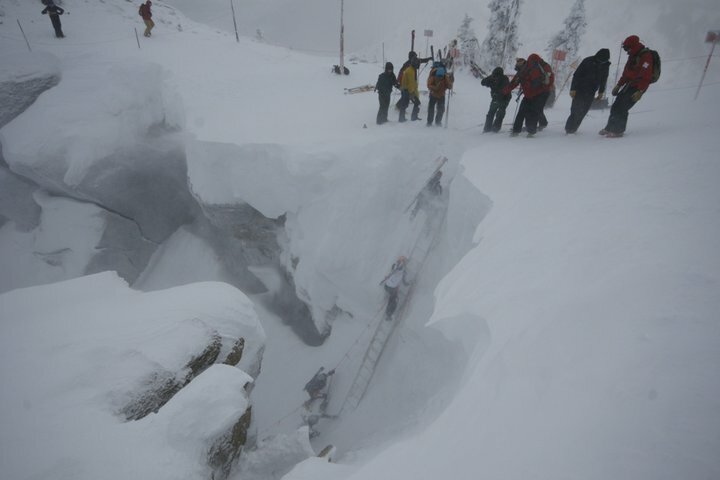 It’s been a tough year for snow in the West, and CB & Jackson Hole are not immuned to this dry spell. The drive to Jackson is usually a dreaded affair as the roads are slick and plain old long (11+hrs). Great roads this year meant one thing, firm snow on the resort and fast driving! Jackson Hole Mountain Resort has been the host for US Nationals for the last 11 years. This race during a World Championship year is always one of three qualifiers, in order to make the US Team that competes over in Europe. This is a non World Championship year, so the race has slightly less significance, but it still crowns the Men’s and Women’s National Champion. 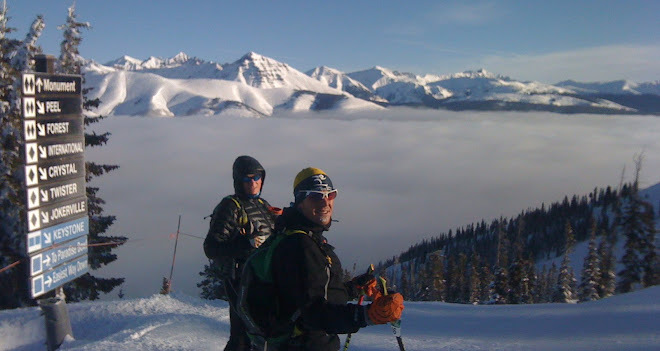 Team Crested Butte sent three of our four athletes to Jackson Hole, with Brian Smith sitting this one out, due to work. Most of the team was able to preview the course on Friday, with the only change to the course being that the “landmark climb” up Corbet’s Coliour was not included due to a lack of snow. Instead they had us go around Corbet’s, with a longer but mellower boot pack. The course preview as expected was hard packed snow with descent coverage, setting up a technical race with challenging skinning conditions. The race started with a deep US field…more and more talent (and skin suits) each year….a great sign for the sport!. Jon and I positioned ourselves in 4-6th place for the first climb with Scott Simmons (Durango, CO) leading the charge. The first descent was a steep, bumped out run testing one’s gear and skiing abilities. The new SCARPA Alien 1.0 were awesome as they are even lighter, and without the bellows….perform soooo much better on the downhills…..they inspire confidence! Perfect conditions today for the boot. Leads were swapped back and forth depending upon each skier’s downhill and uphill skills. If you could find some efficiency on the skinning sections, it would pay dividends later in the race. Two boot packs separated the field and Luke Nelson (Idaho Falls, ID) was able to reel in Scott Simmons and challenge for the lead. Marshall Thompson (CB, CO) established 3rd and myself in 5th. The second last downhill started at the top of the tram and descend over 4100ft …..I can only guess but I bet this took at least 9-10 minutes. Its super techie, bumped out with refrozen “death cookies”, looking to take out the tired racer. I was not able to reel in 4th (Jason Dorais SLC, UT) but at the last uphill transition I noticed Marshall Thompson was not up front on the skin track. I could only assume he got lost on the long descent. This last climb was south facing with skin purchase at a premium….you're blown and the most technical climb of the day was standing in the way of the finish line. As I got to the top of the last climb, 5th place (Ben Parsons Kalispell, MT) about two minutes behind me, so I felt comfortable I cold hang on to fourth with one last techie descent. At the finish line I got fourth (yeah I’m in “that position” …the 1st guy just off the podium). My suspicions were confirmed about Marshall….he indeed did get lost on the second last down hill. Unlucky, but that’s racing. He is talented and will clearly be a force to be reckoned with. Luke Nelson ended up taking the National Championship Title by a minute over Scott Simmons. Jason Dorais end up in third and my self in 4th, Ben Parsons rounded out the top five. In the women’s race Sari Anderson (Carbondale, CO) was crowned National Champion, with Stevie Kremmer (CB, CO) in second and Gimma Arro Ribol, from Spain in third. Listening to Sari at the finish the Gimma was wicked fast on the uphills but not as aggressive on the downhills. The race is tough for a lot of reasons already mentioned, but the stats don’t lie. 8000 ft of vertical gain/loss and over two hours and forty minutes of racing for the guys and probably over three hours for the women….how’s that for many athletes first skimo race of the season?! Jon Brown end up 9th in the men’s division and Jari secured tenth in the women’s division. The weather was reasonably mild with bright sun. I personally ate two gels and about 8oz of Acli-mate during the race. I certainly think I could have benefited by eating one additional gel to have some energy for the last 30-40 minutes of the race. A great day of racing! Good meeting you and your family this weekend. Just wanted to give credit to the right guy. You were mixing it up with Jason, not me at Jackson. He was 3rd. I was 10th. And the last name is spelled Dorais, but it's screwed up all the time so no worries. Nice job again. See you guys in a couple weeks. Copy all that Andy...Seems like we will be bumping into each other and several more races this Winter! Wickenhauser gets slaughtered all the time too...sorry about that! SLC rando race this Friday!